Kapu Ke Ola a Kane! Life Is Sacred To God! Cherish It! E Aloha Ia O'Koa Pa'ulo E!!! 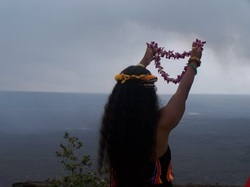 Strengthening and Empowering Hawaiian Spirituality Through Traditional Ceremonies, Rituals and Protocols. Awakened teachers known as Kahuna had mastered the subtle sacred secrets of Aloha and they taught the respected ruling elders who taught the parents who taught their children the sacred ways of Oneness, being in right relationship with the Divine, with the Aina and within their own hearts, a state of Lokahi inherant oneness with all things. In this way we were naturally connected and consecrated to the Heavens and Haumea, the Earth and All things in between. We were One and there was no dividing line between any two people and no dividing line between man and spirit. This was the way of Aloha-love.This was the Way of the ONES Who Know No Separation and See No Division. We knew that the goal of life was to Honor All things Sacred and the Sacredness in All things﻿, to walk up the mountain of life protecting your Sacred Mana, your Aloha, your Sacred Bowl of Light. Malama Mana’o, Protect and Take Care of the Oneness, Harmony, Aloha of your Thoughts, your way of Seeing with the Heart divorcing duality and only Seeing Oneness. Ku’ialua, Hawaiian martial art is the practice of power over Death and Destruction. Ku’ialua understands the mind-Mana’o is your first and best weapon or worst enemy. Every thought, feeling, perception, spoken word and performed action impregnates the universe. It is never forgotten and it is never overlooked. The universe is always vibrationally mathematically exacting in its law of attraction. The thought vibrational resonances are carried in your sacred bowl of light so Malama, take great care. There are only two kinds of thoughts, Aloha and Ha'ole and they can never hold the same space.﻿ There are only two states of mind, inner conflict state and awakened oneness state. Aloha thoughts, you see with the heart, are life enhancing, radiant, vibrations that are aligned with the nature of love, the nature of the Divine. Aloha, which in it's most hidden deepest Kaona meaning, means that which is aligned with or facing the sacred breath, the Ha breath of Ke Akua, Creator, God. Aloha, Being and Basking in the Love in the Divine Presence in the Divine Present Moment in Sacred Relationship as Me and as You. Ancient ones believed that all time is now, that we are each creators of our life's conditions. The most powerful place for making change is in the Now by protecting your heart, protecting your Pure Aloha. Healing Olelo, chants, hula are the heartbeat of people...sacred sound and sacred actions heal and realign pono righteousness, divinity, change DNA, correct disharmony, purify sacred bowl of light, carry the sacred vibration, all knowledge is in that resonance. We have the power that no one nor any circumstance can take away, the power of ALOHA is the power to SHINE LIGHT INTO DARKNESS! No matter how dark it gets. We were told of the Great Huli when the earth would turn after 2012, a time when our Heads will be placed Lower than Our Hearts when we let go of ways that have not served us and return to PONO when we feel before we Think. We must prepare by becoming vibrationally correct having a sacred bowl of light that is filled only with radiance of aloha, love, gratitude and oneness, void of all contracted thoughts and feelings. This is the sacred Hawaiian way of Pure Aloha. Imua o ho'opomaika'i o ka makana...Let's move with the Gift of Blessings, the gift of Aloha. Imi ke ola ina Akua… Let’s invoke the Gods to promote vigorous abundant growth and healing on the earth. Living with the power of ALOHA, a Sacred Vibration of the heart will radiate and set Right All Your Relations to Life, to Love, to Health, to Wealth and to the Healing of this world, Haumea. Being vibrationally PONO, in sacred alignment with Love, Aloha is our only protection and guarantee to smoothly, peacefully and joyously transition the Paradigm Shift, the Great Huli of 2012, Awakening into Oneness. Amama Ua Noa! The Kapu is Lifted. The prayers fly free! Any Thought That Causes You Suffering Stems From a Lie. To Create a Conscious World of Whole and Empowered People Who Know Who They Really Are and Live Life Loving God, Giving Thanks For All of Life's Gracious Generosities and Expressing Their Inner Greatness. No Kind Deed Has Ever Lacked It's Reward. I Am Consciously Receptive to It in All Things and In All Ways. Aloha ia O'koa Pa'ulo....When We Meet in Love, We Shall Be Whole! Awakening into Oneness/Lokahi, the true spirit of Aloha. My Mission is to Bless and Empower Others to So Love Themselves So Much that they, too, Devote their Lives to Awakening into Oneness, Making Love Your Way of Life, Being Completely Aligned with the Divine in Perfect and Sacred Relationship with God, Life, Love, Health, Wealth, Inner Joy and Perfect Self Expression as Spiritual Warriors Returning to the Sacred, upholding Ancient Hawaiian Values the Sacred Hawaiian Way, Healing All Relationships and Living Pono. Aloha Onipa'a! Malama Ponoloa! Ho'i i ka Pono!!! To Perpetuate Health and Wellbeing of Mind, Body & Spirit thru Inspiring Our Ohana To Live In The Spirit of Aloha Making Love Our Way Of Life and Educating Our Ohana in The Sacred Hawaiian Way of Malama/Taking Cherished Care of All Relationships, with Spirit, Life, Mind, Love, Body, Inner Peace, and Harmonious Pono Relations Living By Example Creating a Healthy Wealthy World. Energy Medicine has become a very popular Complimentary Alternative Healing Therapy. It is the Medicine of the future! It is the Medicine of Our Ancestors! We have Amazing Nurturing Crystal Healing Baths, Infra Red Sauna, BioMat InfraRed Lomilomi, Alkaline Water, Current Room, Hawaiian Blessings for Healing, Weddings, Romantic Vow Renewal, Relationship Counseling, Hawaiian Seawater Cleanses, Lomilomi, Baby Lomilomi, Ho'oponopono 'I'ike Preventive Protocols for Maximizing Relaxation and Wellbeing as well as Symptomatic, Diagnosed Protocols and Distance Healing Protocols for Restoring Health and Wholeness.